One of the problems with the methods of training I use (running, cycling, and weightlifting) is that they all result in a lot of muscle tightness that builds up over time, making me inflexible, sore, and irritable–all things that make me want to avoid working out. Since riding itself can contribute to muscle tightness, especially in the hips and lower back, I’ve found a number of ways to combat this unfortunate downside of my training regimen. Getting in the water is a great way to ease sore muscles. Swimming is itself an excellent full-body workout that is especially helpful to sore joints because of its lack of impact. But even going for a dip without doing laps can be quite restorative. After a hard run or weightlifting session, getting in the pool and relaxing helps my muscles recover more quickly. Doing some flowing movements and stretches in the pool stimulates the muscles with a light resistance created by the water, preventing them from getting stiff as they heal. I’ve written before about the benefits of yoga for a rider’s flexibility, and in my opinion, yoga is the best cross-training for riding and all of my other training methods. It contributes to the length and suppleness of the muscles, a perfect counterbalance to the tightening caused by building strength. But what if you don’t have access to a pool and can’t find the time for a regular yoga practice? I found a very inexpensive, effective solution that I can do at home: Yoga Tune Up® Therapy Balls. I was actually introduced to these amazing things back at my yoga studio in Brooklyn and recently I’ve been incorporating them more often into my recovery program. They’re basically two racquetball-sized balls that are used for self-massage, not dissimilar to the rollers found at the gym. The balls target trigger points and can get in deep to alleviate muscle pain in more specific areas than the rollers. It’s quite an experience. Laying down on your back with them underneath you, you find all sorts of amazing mayhem in your muscles that you weren’t even aware of. The beauty of self-massage is that you can do it as long as it takes to alleviate the pain in each muscle, without being rushed off a masseuse’s table or trying to air-traffic-control your significant other to massage just the right spots. For me, the most productive area seems to be my lower back. 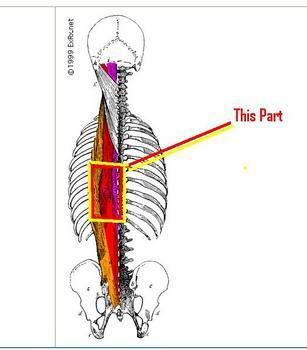 The long muscles going parallel to my spine–the spinal erectors–became extremely tight, and are often the source of my hip pain. Hamstring tightness contributes as well, and my poor hips become pulled between these two very large muscle groups. After using the Therapy Balls, I feel a huge difference. Often, I can feel the release while I am using them, as a muscle finally lets go of its tension and everything around it relaxes. I used the balls yesterday afternoon and then went for a run in the evening. My body felt refreshed, limber, and there was a spring in my step that hasn’t been there for a couple of weeks. I’m going to try incorporating the Therapy Balls once or twice a week–especially after I ride–to see if more regular usage keeps helping my muscles retain their flexibility and elasticity.